Once the NAKD deal completes, TokenPay hinted there would be the option to purchase the company's products using crypto. As Cointelegraph reported, TokenPay has branched out into unanticipated industries before. In June last year, the startup partnered with the nonprofit body behind Litecoin (LTC) to acquire a roughly 10 percent stake in a German bank. Prior to that, a $2.5 million token investment saw TokenPay support efforts by privacy-focused cryptocurrency Verge to make major adult entertainment website Pornhub support its XVG token. The project appeared to have mixed success. In February, Draper argued that in five years, fiat money will be used only by criminals. Meanwhile, Argentina has recently been friendly to adopting new developments in the blockchain and crypto space. In early March, the government of Argentina agreed to co-invest in blockchain projects that are backed by Binance Labs and Latin American crypto exchange LatamEx. Binance CEO Changpeng Zhao also hinted at the establishment of a new fiat-to-crypto exchange in Argentina. In February, Argentina settled an export deal in Bitcoin, selling pesticides and fumigation products worth of $7,100 to Paraguay. The purchase was paid for in Bitcoin and then converted into Argentine pesos to settle accounts with the exporter. the de facto ruling authority of the Gaza Strip in Palestine — has appealed to its supporters to send it funds using Bitcoin (BTC). The appeal was made via the official Telegram channel of Abu Obeida, a spokesman for Hamas’ Izz ad-Din al-Qassam Brigades, on Jan. 29. Hamas — which comprises social service arm “Dawah” and militant faction “Izz ad-Din al-Qassam Brigades,” is deemed to be a terrorist organization, in whole or in part, by several countries and international organizations — including the United States and the European Union. Russia, Turkey and China are among those major world powers who do not designate the group as a terrorist entity. In his message, Abu Obeida called upon “all lovers of the resistance and the supporters of our righteous cause to support the resistance financially using ‘Bitcoin’ currency,” adding that an exact funding mechanism for transacting the crypto would be announced later. “The Zionist enemy is fighting the resistance by trying to cut its support by all means, but the resistance lovers in all the world are fighting these Zionist attempts and are seeking to find all possible support for the resistance." Abu Obeida’s turn to Bitcoin comes in the immediate context of Israeli Prime Minister Benjamin Netanyahu’s decision to temporarily freeze millions of dollars in Qatari aid — including $15 million a month to pay the salaries of Hamas civil servants — from entering the Gaza Strip, in retribution for a recent flare-up in border tensions between Israel and Hamas. Aside from the Gaza Strip blockade, given Hamas’ designation as a terrorist entity in many Western countries, many global banks bar services to the group via their anti-money-laundering (AML) and illicit terror financing prevention mechanisms. As reported, the U.S. House of Representatives passed a bill last September that would establish a crypto task force to combat terrorist use of cryptocurrencies. A congressional hearing earlier that month had nonetheless concluded that while al-Qaeda, the Islamic State and other such terrorist groups have all attempted to raise funds through crypto, their success has been limited — and that in many instances, fiat currencies provide more robust anonymity for illicit fundraising. and 337 times so far. But despite the current bear cycle, data show that Bitcoin has grown more than 82,000 percent over the last seven years. According to the website Bitcoin Obituaries, there were 91 publications in 2018 that announced the demise of Bitcoin (internationally even much more). Interestingly, even in 2017, the number was 125, the number actually increased after Bitcoin reached its all-time high of about $20,000 in December. Altogether, the black painters, according to the website, Bitcoin since 2010 for 337 times declared dead. But how dead can it be if it works around the clock with near-full availability and has been operating for over a decade now? It is true that the continued bear market has been steadily adversely affecting Bitcoin price. Bitcoin is currently trading more than 80 percent below its all-time high so far. However, if you measure Bitcoin only in terms of its price in dollars, it turns out that Bitcoin not only that is not dead but has actually grown by more than 82,000 percent in the last seven years. In addition, the basics are still intact, while other metrics, such as hash rate (network security) and layer 2 scaling solutions (such as the Lightning Network) are actually experiencing unprecedented growth. Regardless of how often the black painters have announced the sinking, so does the number of investors own or use Bitcoin. Four separate studies by the Ontario Securities Commission and the Central Bank of Canada show that three to five percent of Canadians own Bitcoin. Another survey conducted by the market research institute YouGov revealed that up to nine percent of British residents own the cryptocurrency, while 90 percent have since heard of Bitcoin and cryptocurrencies. In addition, the state of Ohio accepts Bitcoin for tax payments. And for what is supposed to be “dead”, over $410 billion was transacted in 2018 over the Bitcoin network or an average of $13,000 per second (despite its falling value). After all, this is not the first time the cryptocurrency has suffered 80 percent loss. However, as it turns out, Bitcoin came back every time and reached an even higher level. Markethive has made a very bold statement. We are so confident in this year, regardless of the crypto bear markets, the massive ICOs failures, the compounding Government regulations, the incessant attacks by the financial elite and the pounding of the negative media attention, that Markethive is laying it on the line. Even one of my mentors Tom Lee who is most outspoken and positive regarding Bitcoin is being slammed and called Dubious. Many critiques are predicting the total demise of Bitcoin. I disagree, but then I could be wrong. 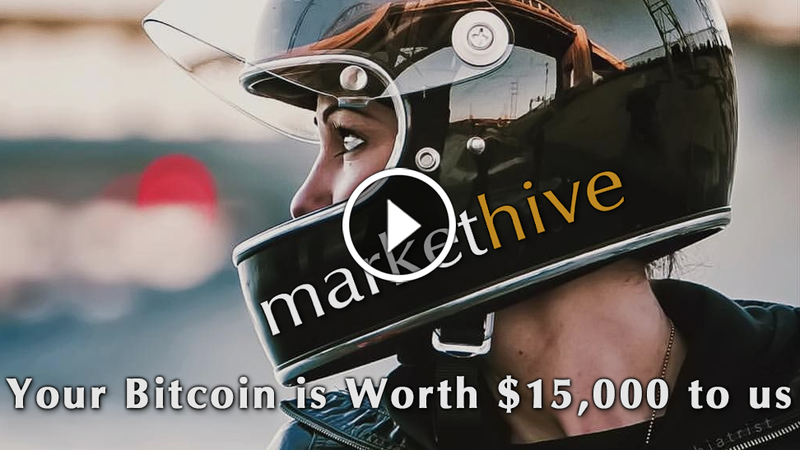 Markethive CEO makes a bold move to accept Bitcoin based on current projections as valued at $15,000 in his end of year prelaunch crowdfunding for limited ILP shares. of $15000 in regards to acquiring our ILPs. Regardless what the market value of Bitcoin and there are many experts predicting Bitcoin will bottom out at $2500 and even a few antagonists claiming Bitcoin is going to hit zero and disappear. We are ready to take that risk. Primarily because we have high confidence in both Bitcoin and Markethive. This offer is by way of Bitcoin. To take us up on this offer you must send us Bitcoin. Yes, this is a limited offer, so you know what to do. In other words, beginning now in the last of 2018 and into 2019 until we have traded 100 ILPs the offer for 1 Bitcoin as payment in full for 1 ILP valued at $15,000 stands." BITCOIN: STOP Focusing Only On Price. What is Fair Value? Thomas Lee, head of research at Fundstrat Global Advisors, "User adoption and Bitcoin's acceptance as an asset class are key factors that will push it higher in the future." Lee's explanation for the digression is due to last year's meteoric rally, a meltdown in the macroeconomic climate and treasury sales during initial coin offerings. Thomas Prendergast, CEO, of the world's first Market Network on Blockchain, Markethive, adopts the same sentiments as he has noted. "Interesting parallel with Tom Lee Fundstrat co-founder and myself, we are two men with vastly different backgrounds, but both strong advocates of crypto both recognizing the damages caused by the huge expansions of the ICO crowdfunding campaigns of 2017 and particularly 2018 by people of questionable character." Thomas Prendergast and Douglas Yates, CTO, and Co-founder agree with Tom Lee's assessment regarding the actual fair value price of Bitcoin is around $14,000, hence the announcement stated above. "Market networks have been defined as the logical evolution of aging social networks. The SaaS and commerce platforms are integrated with the social network in Market Networks such as Markethive. Techcrunch is quoted in an article, 'Market networks will produce a new class of unicorn companies and impact how millions of service professionals will work and earn their living." "In order to fund the Universal Income for entrepreneur's aspects within the realm, Markethive also adds additional revenue-producing systems. Markethive is now in its final stages of implementing the blockchain and about to deliver the first of many Infinity Airdrops of the consumer coin, to the associates of this ingenious platform. There is also the strategic partnership with the GreenHouseHives which are self-generating powerhouses, These facilities also become a decentralized data storage system for various hybrid advanced blockchains, forked from Markethive's blockchain system.Markethive is fully operational as a beta platform, the coins have been created, the blockchain is in place, and every milestone in the white paper to date has been met on time." the Bitcoin price has recovered back to around $4,000. The dominant cryptocurrency, which still holds a market valuation of over $64 billion, has demonstrated wild volatility in a wide price range from $3,100 to $4,300 throughout December, struggling to recover to November levels. Last month, the cryptocurrency market was valued at around $220 billion. As of December 28, the valuation of cryptocurrencies remains at $133 billion, down $87 billion within a 30-day span. According to Francis Pouliot, the CEO and co-founder of Bull Bitcoin, a company based in Canada, the asset will recover as individuals continue to build on top of the protocol and the infrastructure supporting the currency strengthens. Throughout the past nine years, Bitcoin has consistently survived major corrections, which on some occasions worse than the 2018 bear market, as the builders, developers, and companies prepared to support the next wave of investors and users during a market downturn. The way I see the price of Bitcoin: there are fundamental psychological, economics and social tenants that seem to create a similar pattern. Price rises fast, crashers down but at higher ladder with the new skin in the game added as value hodlers is discovered by the market. As an investor my these focus on the tail of distribution of Bitcoin network/ecosystem participants. Top new people active with skin+soul in the game, momentum, influence, resources, commitment, ideology, full nodes, sovereignty. It is People that give Bitcoin its value. To be sure, Bitcoin is still a nascent technology, and doesn’t offer cutting-edge usability, speed, or privacy. But engineers are constantly working to bring those attributes to Bitcoin by building better apps and on-ramps, upgrading the base protocol, and creating new second layer technologies like the Lightning Network, which could eventually mask and dramatically scale the number of possible bitcoin transactions per second. Throughout the past two years, many cryptocurrency-focused hedge funds have emerged with the intent of holding onto crypto assets as a long-term investment. In the long run, Pouliot emphasized that as these hedge funds acquire tens of thousands of Bitcoin, the circulating supply of the digital asset will decline, restricting the potential amount of Bitcoin investors could buy in the public market. filled with fresh optimism and newfound determination to make 2019 the year when cryptocurrencies take over. Having gotten their calls badly wrong for 2018, so-called experts will be hesitant to make bullish price predictions for 2019. That’s probably for the best since there are far more interesting things to focus on than price action. Here are seven trends that should dominate the cryptosphere over the next 12 months. This time last year, all kinds of bold predictions were being issued for what 2018 would hold for the crypto space. In the event, the biggest trend of the year was one which few futurologists foresaw – stablecoins. 2018 will go down as the year the markets went south and ICOs died off, leaving a new wave of digital assets to shine – dollar-pegged stablecoins. Love, hate or tolerate them, there’s no denying that stablecoins were a recurring motif this year. Whether they will continue to dominate in 2019 depends to a large extent on how conventional crypto assets perform. Should the current bear market persist, or bite deeper still, stablecoins will remain ubiquitous. If more favorable market conditions return, however, stablecoins will be forced to take a back seat, leaving the following trends to joust it out in 2019. Amazix head analyst Jose Macedo believes the security token offering (STO) will become the standard model most crypto-based projects deploy. “While utility tokens are far from dead, what the industry has now realized is that few of these token economic models actually made sense in terms of long-term value capture,” he explains. “As a result, we’re seeing a lot of projects come to us looking for help in either launching their STOs or restructuring their ICOs as STOs,” adds Macedo. The Bitcoin Cash community will continue to find new ways to spend and receive peer-to-peer cash, while the BTC brigade will have optimism that 2019 will finally be the year when the Lightning Network proves its suitability for something more than purchasing stickers. Custodial services for institutional investors will improve, bringing new money into the crypto space (but probably not propelling crypto assets to new highs). NYSE’s Bakkt will launch, bringing physical BTC futures contracts, and there’s an outside bet the SEC might approve a bitcoin ETF. Stripped of much of the greed that characterized the dawn of 2018, and with 12 months of robust infrastructure work completed, 2019 is shaping up to be an exciting time for cryptocurrency users from all tribes, countries and continents.